Citation Information: JCI Insight. 2017;2(14):e94623. https://doi.org/10.1172/jci.insight.94623. 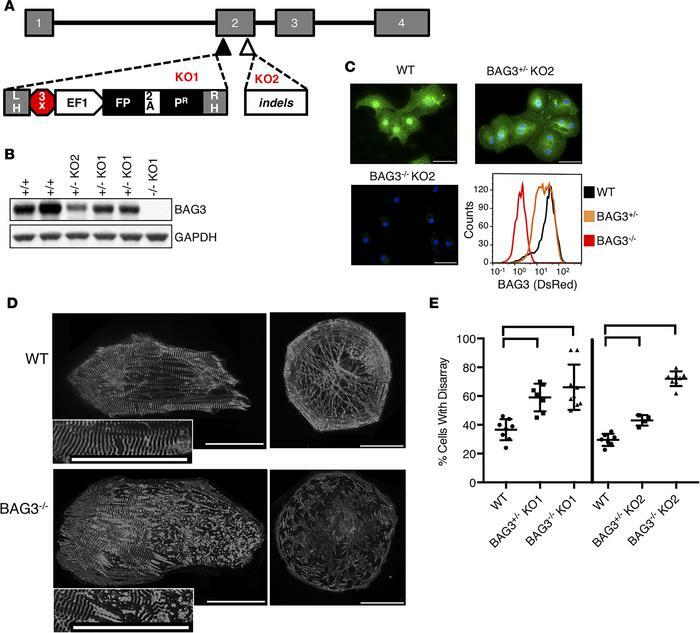 Genome engineering an isogenic series of BAG3 mutations leads to sarcomeric disarray in human induced pluripotent stem cell–derived cardiomyocytes (iPS-CMs). (A) Schematic of the BAG3 gene with 4 exons in the predominant coding isoform. Because an alternatively spliced isoform excludes the first exon, the second exon was targeted for knockout. BAG3-knockout lines were generated using TALEN-induced (black triangle) targeted integration of the knockout vector in exon 2 (KO1). The vector included flanking left and right homology arms (LH and RH, respectively) with a terminator sequence in 3 reading frames followed by the mCherry fluorescent protein (FP) and a puromycin selection cassette (Pr) driven by the EF1α promoter. Transient expression of Cas9 with a guide RNA targeted downstream in exon 2 (open triangle) induced small insertions/deletions (indels) by nonhomologous end joining, resulting in frameshift and nonsense mutations (KO2). (B) Western blot for BAG3 protein in iPS-CMs. (C) Immunofluorescent staining and flow cytometry with antibody targeting BAG3 in iPS-CMs. Scale bars: 50 μm. (D) Examples of pathology seen in BAG3–/– iPS-CMs compared with WT controls. Cells were plated on glass coverslips, fixed, and stained with antibody against ACTN2 to label Z-disks. Scale bars: 50 μm. (E) Quantification of sarcomeric disarray from blinded scoring on a 5-point scale, with disarray defined as the percentage of cells scored as class 3–5. Individual replicates are plotted with mean and SD. Brackets indicate significant differences (P < 0.001) by 1-way ANOVA with Bonferroni’s test for multiple comparisons. For KO1 analysis, 7–9 independent cultures per line from 3 separate differentiations were scored. For KO2 analysis, 4–8 independent cultures per line from 2 separate differentiations were scored.